Want to be the life of the party and create a house party that will be remembered? Whilst we can’t help you setup and plan that amazing party, we can offer you some trendy and fun bar stools. One of the key aspects to a great bar stool is its comfort level. Decor8 Hong Kong furniture wants to offer this to you with a bar stool that offers comfort with a minimalistic design. We present to you our Hubert Contemporary Padded Bar Stool from our range of bar stools. So what makes this bar stool so special? This depends how you plan to add it into your space. In a dark setting it can make the seats appear as though they are floating in space. Coupled with its slim lined frame, it makes them lighter than your average bar stools and allows you to easily move them around. The frame is made of steel and comes with rubber pads to stop it from scratching your floor. The Hubert Contemporary Padded Bar Stools can work well even if you decide to add it into a room with other materials. The simplicity of the design allows the bar stool to blend in seamlessly into any modern interior. It also helps that the seat pad comes available in many different colours with the option to go fabric or leather. Why not try this bar stool out for yourself in our Wan Chai showroom? There you’ll see it in all its physical glory but hurry because it won’t be there for long if someone decides to purchase it. Whilst you’re there you can check out some of the other styles we have to offer. Don’t hesitate and come in! 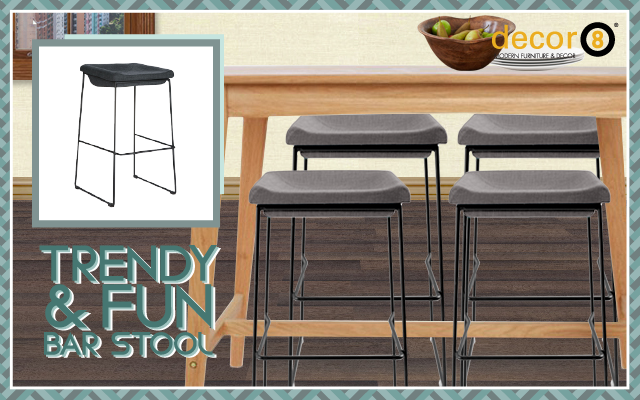 You may walk away with a trendy and fun bar stool at an amazing offer that you can’t resist. This entry was posted in Barstools, Seating and tagged bar stools, colorful, fabric, hong kong bar stools, hong kong furniture, leather, light bar stools, minimalistic design, steel bar stools, trendy bar stools.